On that brilliantly sunny day, as temperatures approached 80 degrees, her comment neatly summarized the mood here. With the autumn equinox approaching and the grape harvest in progress, this time of year is at once a celebration of abundance and a last hurrah. As each fruit or vegetable, from the last plum to the first pumpkin, moves into – and then out of – season, we joyously anticipate the rituals. For the past three years, from Labor Day until shortly before Thanksgiving, we have rented homes for roughly a month at a time in various regions of France. Ken is retired, our only child is in college, and I can work remotely. Typically, we start at the northern-most point on our itinerary, and chase autumn south as the weather gets cooler. This routine, which so far has included lengthy stays in the Loire Valley, Basque Country and the Périgord, enables us to sightsee at a leisurely pace while living like locals. Here are aspects of life in France that we look forward to as fall unfolds. 1 La rentrée. This day, which roughly coincides with our Labor Day, officially marks the end of summer vacations in France. And just when the kids go back to school and their grown-ups return to work, is when we like to begin our French sojourn. Prices on rental properties go down; there is less traffic on the roads; and as the crowds thin, you can enjoy less company – or blissful solitude – at popular tourist destinations. Quetsche and Mirabelles at the Strasbourg market. 2 Outdoor markets. 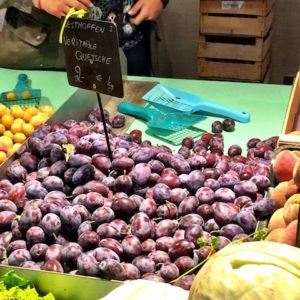 Though most French food shopping takes place at large supermarkets, we much prefer the open-air marchés volants (roving markets), scheduled once a week – or sometimes more often – in particular towns or cities. The prices may be higher or lower than in the supermarkets, and the quality isn’t always better. But the market may also offer opportunities to purchase items that are not readily available nearby. For example, though Turckheim has two boulangeries, it has neither a butcher nor a cheesemonger, so we took advantage of the Friday market last week, held in Place de la République, to buy both meat and cheese. Markets held on Fridays, or over the weekend, also tend to be lively social gatherings. We enjoy the banter, with merchants and other shoppers who care passionately about food. Right now the conversation revolves around at least half a dozen varieties of plums. In addition to the big round yellow and purple plums that we are accustomed to, there is an assortment of bite-size varieties. On past trips I snatched up the ultra-sweet Reine Claudes, recognizable by their green skins. This year I am becoming a fan of the smaller, rounder, even sweeter, yellow-skinned Mirabelles, which come from the area around Nancy, a city in Lorraine about two hours northwest of where we are now living. But how to tell the much-prized Alsatian Quetsche (pronounced ke-WETCH) from the apparently less desirable variety known simply as a prune? At the Friday market in Turckheim, I observed a shopper ask permission to taste a piece of fruit, and then accuse the merchant of trying to pass off the latter as the former. The next day, at the market in Strasbourg, I bought 500 grams (about a pound) from a merchant with a posted sign that said “Veritable Quetsche.” The oblong shape is one clue. But I will need to eat a lot more of them to be able to tell the difference in a blind taste test. 3 Homemade jam. If you arrive in France too late to eat a particular fruit fresh, or just want to prolong the pleasure, this is another option. Signs at the market this weekend urged shoppers to put up confiture – for example, of the red and black myrtle, both of which are in season right now. Though we never eat jam in the United States, while in Basque Country two autumns ago, we became much enamored of the black cherry preserves, which are ubiquitous there. They are made with cherries from the village of Itxassou, where the spring crop is abundant enough to supply the whole region. When I finally succumbed and bought a jar of it, I found it paired well with the region’s piquant sheep’s milk cheeses, and when spread on French butter cookies known as sables. The following year, in the Dordogne, we became similarly enamored of the fig preserves, which make their appearance just as the autumn crop is starting to disappear from the markets. 4 Pastries of the moment. 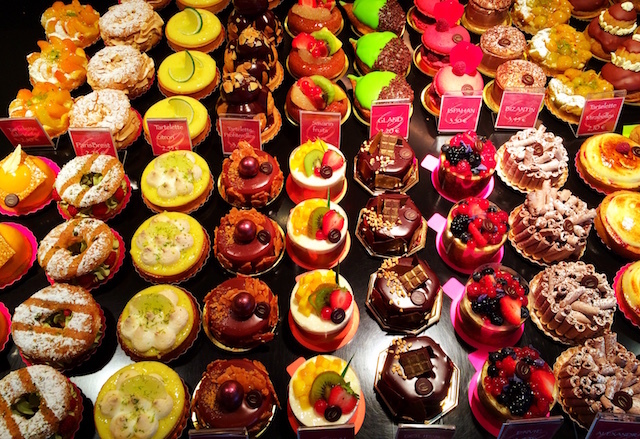 The best of the market finds its way into pastries. Spotted Friday at Boulangerie Pâtisserie Husser (2 rue Wickram, Turckheim): individual fruit tarts made of myrtle, apples and Mirabelles. We began eating our way through the display case. So far our favorite item is an éclair filled with two types of cream and fresh raspberries, which easily fed the two of us. The berries were so good that the next day we skipped the éclair and, at the market, bought an entire basket of them. 5 Les journées du patrimoine. The third weekend in September, which this year falls on the 16th and 17th of the month, France celebrates its heritage days. All over the country, certain landmark buildings, which are normally closed or charge admission, are open for free to the public. Last year we observed the occasion in the medieval village of Sarlat, with its labyrinth of sandstone buildings. On Saturday evening, streets are lit with votive candles. And during this celebration, under the stars, we attended a superb chamber music concert, in the abbey of the cathedral, where there were few tourists in the spirited audience. 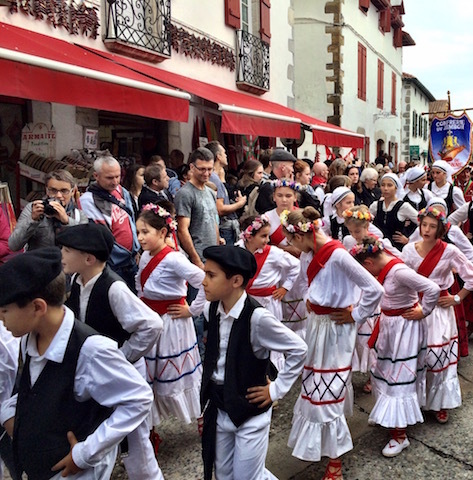 A Sarlat resident tipped us off about these events – French heritage days are not well publicized to tourists. So we have learned to ask around and watch for posters that go up in each village, just a week in advance of the celebration. In Alsace, we can receive at least some announcements digitally by subscribing to daily e-mails from Tourisme-Alsace. 6 Other autumn festivals. Though the crowds can be horrendous, these weekend events, held throughout the fall in rural France, are a great way to soak up local color. One of our favorites so far has been the Fête du Piment, marking the chile pepper harvest in Basque Country. Held the last weekend of October in the village of Espelette, it includes a parade down the main street featuring children dressed in traditional Basque costumes. On our first day in Alsace, we were ill-prepared for the mob scene at the medieval-themed Pfifferdaj festival, always scheduled for the first Sunday of September, in Ribeauvillé. To position themselves for the parade, which begins at 3 p.m., people set up folding chairs along the main street many hours in advance, or reserve tables at restaurants where they will be well situated to watch the procession. We arrived around noon, too late to snag a spot and too early to wait it out from a standing position in the blazing sun. The best we could do was ogle those in wild costumes – of winged characters with green-painted faces and pugged noses – chugging Alsatian beer as they waited for the main event. Future visitors can be forewarned; it was one of those moments in foreign travel when I wanted a do-over. 7 La vendange (grape harvest). 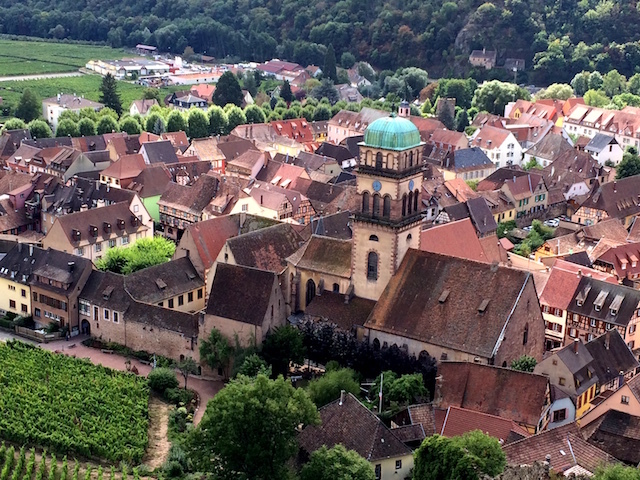 In the great wine-producing regions of France, including Alsace, the Bordeaux and the Loire Valley, vineyard tours are a popular activity for tourists, and visitors in mid- to late September can take part in wine festivals sponsored by individual villages. But we find serendipitous encounters with winemakers even more fun. Along the Alsace Wine Route near Turckheim is a sign that says vendangeur. This is a warning to motorists that there are grape pickers at work. 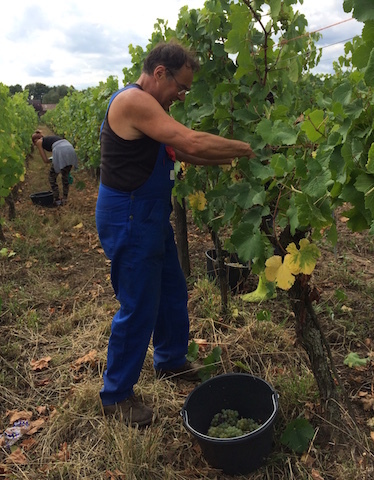 As we traveled that route last week, we pulled over north of Kaysersberg, near Mambourgweg, to observe the harvest in progress. A bevvy of workers was snipping bunches of grapes, which they carried in buckets, and then deposited in enormous yellow containers of the sort that we see being carted on trucks and tractors all over the region. As we got out of the car to watch, we were greeted by a large suntanned man with a mane of curly gray hair and red horn-rimmed glasses. He turned out to be the boss – Marc Tempé, whose Zellenberg winery exports to, among other places, our hometown of New York. 8 Walnuts. Though we consume few walnuts back home, in the Périgord last year we caught walnut fever. The route along the Dordogne River, from our rental in the medieval village of Domme, took us on a road called Route de la Noix (Walnut Route), where walnut orchards are interspersed with cornfields. In those orchards we saw walnuts being harvested by high-tech and low-tech means. Elsewhere we observed townsfolk with plastic bags, helping themselves to fallen nuts along the side of the road. When the weather turns foggy and rainy, it’s important to gather the nuts before they rot. And soon we were out doing that ourselves. We then added walnuts to every conceivable recipe and dressed our salad with freshly pressed walnut oil. Like so many other crops, walnuts are affected by the weather. A late April frost in the Dordogne destroyed half the walnut buds this year, so the harvest will be much less plentiful. That will surely affect the prices, especially of nuts transported to other regions. Still, we eagerly await their arrival in the markets. And when that happens, we will be ready: In a kitchen drawer of our current rental, I have already located the nutcracker. 9 Oysters. The French swear by the old adage that you should eat raw oysters only in months that contain the letter “R“ in the name. The origin of this advice is partly a matter of public safety: Shellfish toxins thrive in warmer waters. To some minds, the months of April and September, which can be warm, are marginal. But by mid-October fishmongers start featuring oysters, and the French can be seen relishing them in restaurants. Wherever I am, I order what seems to be moving, on the theory that the locals know what a good value is. Most often it’s been the decidedly unfleshy Fines de Claire. The appellation Fine de Claire, used for quality control, refers to the manner of production of these small to medium-size oysters, which come from the French Atlantic coast, in the Marennes-Oléron basin. During the last several weeks of their development, they are moved to salty marshes, called claires, where they finish maturing. This also makes them less salty than oysters raised completely in the sea. 10 La Toussaint. As the last Sunday of October approaches, we prepare to set the clocks back and get ready for the French to be on vacation again. November 1 is a holiday here. It’s called La Toussaint, which is a contraction of Tous les Saints (All the Saints). For a week or two on either side of it, many schools are closed and families take to the road. In anticipation, merchants who will be en congé (on vacation) post a notice of that in their store windows or market stalls at least one week before. With that, our blissful solitude in rural France comes to an end. If we want to eat at a restaurant, we must plan ahead and make a reservation. For this brief interval, and by now prepared, we don’t mind jostling with the crowds. An air of celebration marks this chronological dividing line. After that, in many popular vacation destinations, stores, restaurants and hotels will be shuttered until Christmas. Places that had been bustling just a week earlier take on a ghostly air. This is when we head to Paris to spend a couple of weeks in a rented apartment. By then it’s dark and cold – the French use the word triste (sad). But in the cafés the Parisians know how to shake it off with a glass of Champagne. At the enormous outdoor Sunday market at the Bastille, I will look for my favorite Moroccan persimmon vendor. First, he carves off a slice of the most luscious, bright-orange fruit for me to sample. Then, after he has weighed my purchase, he throws an extra into my bag, gratis, and says à la prochaine (see you next time). He couldn’t possibly remember me, but he knows how to keep customers coming back. You made my mouth water.